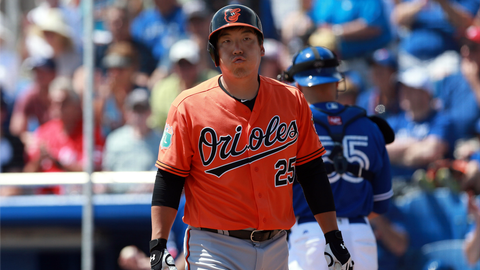 Are the Orioles looking to send struggling outfielder Hyun Soo Kim back to South Korea? SARASOTA, Fla. — A little more than a year ago, the Orioles reached a deal to release pitcher Suk-min Yoon from his contract so he could return to South Korea and rejoin his team in the Korean Baseball Organization. Orioles general manager Dan Duquette, asked Saturday if such a possibility was realistic, said, "I don’t know if we’re there yet," indicating that he is still evaluating Kim. Duquette added that such a decision would not rest solely with the Orioles. Kim would need to affirm that he wants to return to South Korea, and a team in the KBO would need to show a willingness to sign him. Kim’s two-year, $7 million contract with the Orioles states that he "may not be assigned to minors," though it is possible he could agree to such a demotion. Yoon left the Orioles after the first year of his three-year, $5.575 million contract, enabling the team to save $4.3 million in salary and expenses, according to the Baltimore Sun. Team Korea’s Suk-min Yoon in 2013. Kim, 28, became a free agent after spending nine seasons with the Doosan Bears, for whom he hit a career-high 28 home runs last season, improving his career OPS in the KBO to .895. The parallels between Yoon and Kim are not exact — Yoon never reached the majors in his one season in the Orioles’ organization, while the O’s signed Kim with the idea of making him their regular left fielder. Kim, though, is batting just .182 with a .411 OPS in 48 Grapefruit League plate appearances while a previously unheralded outfielder, Rule 5 pick Joey Rickard, has been the talk of Orioles camp. Rickard, selected last December from the Rays, is batting .392 with a 1.044 OPS after reaching base four times Saturday in the Orioles’ 16-8 victory over the Red Sox. He also has stolen five bases in six attempts while also impressing club officials with his defense and aptitude. Kim is not as good defensively as Rickard, leaving the Orioles with potentially below-average defenders at both corner-outfield positions — the other being Mark Trumbo, who likely will be the primary right fielder with Pedro Alvarez serving as the primary DH. Baseball people generally resist placing too much emphasis on spring-training statistics, whether positive or negative. One Orioles official, in fact, expressed concerned that the team was "over-evaluating" Rickard, whom the Rays left unprotected on their 40-man roster last November. Kim struck out during the first inning against the Blue Jays on Mar. 15. Duquette, meanwhile, warned against rushing to judgment on Kim, a left-handed hitter who would help balance the Orioles’ predominantly right-handed lineup. "These transitions, they take a while," Duquette said. "You’ve got the language. You’ve got the culture. The baseball is a little different. There are better pitchers here." Jung Ho Kang, who left the KBO to join the Pirates last season, batted only .200 with a .724 OPS last spring before becoming one of the National League’s top rookies during the regular season. 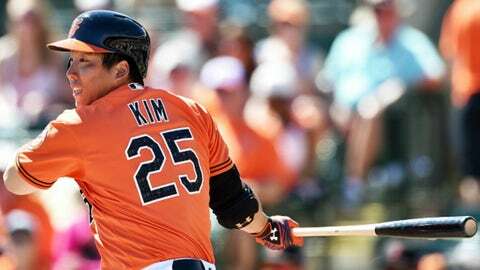 Then again, if the Orioles believe that Kim simply cannot succeed in the majors, their best course might be to seek the same type of closure that they did with Yoon, who signed a four-year, $8.2 million deal upon returning to his old team in the KBO, the Kia Tigers. These transitions, they take a while. … You’ve got the language. You’ve got the culture. The baseball is a little different. There are better pitchers here. The Orioles then could use some of their savings to add a left-handed complement for Rickard — perhaps someone like David Murphy, who is friendly with O’s first baseman Chris Davis from their time together with the Rangers. Murphy, who is not expected to make the Red Sox’s roster, is one of several outfielders who could become available as Opening Day nears. The Orioles also are looking for pitching help, both starting and left-handed relief. 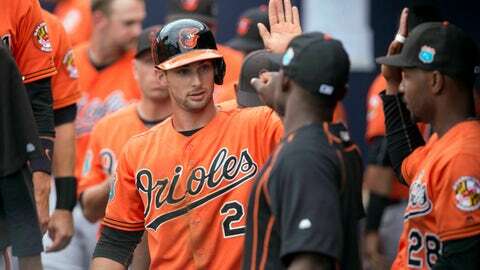 Orioles center fielder Joey Rickard (center) is congratulated after scoring against the New York Yankees. The easiest and perhaps most likely solution left is for the Orioles to let the situation play out, not placing too much faith in Rickard or too little in Kim. It might be the only solution available in the short-term, if Kim will not or cannot return to South Korea.